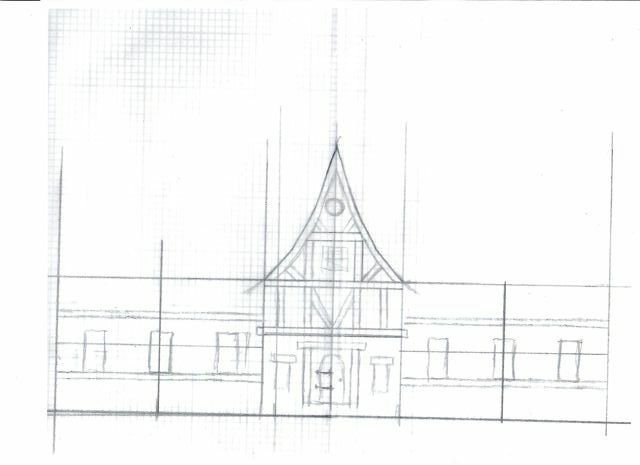 I am almost finished with the Tudor house which they call a “Half-Timbered House” in England. The base is drying and that’s about all that needs to done. Here’s a photo of the quick sketch I did to make the pattern. Structurally, the house was really easy so I didn’t do anything more than that to make the house pattern. I painted 2 sheets of cardboard to make strips to look like wood. First a layer of ochre paint, then burnt sienna followed by burnt umber. So I went from light to dark. The darker paints I just brushed on leaving a little bit ochre showing through to look like lighter streaks in the wood. 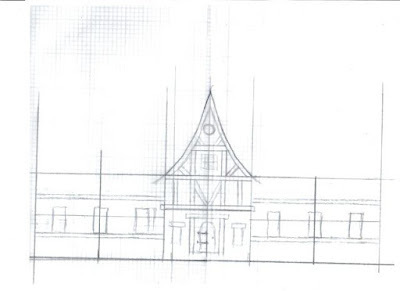 Then I put the pattern down on the painted cardboard so I could trace the roofline and cut that “wood” out first. Then I cut the rest of the strips on the paper trimmer. I glued the cardboard wood on before I assembled the house because I figured I could get better adherence that way. The base of the house was painted with a color called parchment. The roof was surprisingly easy despite the curve. 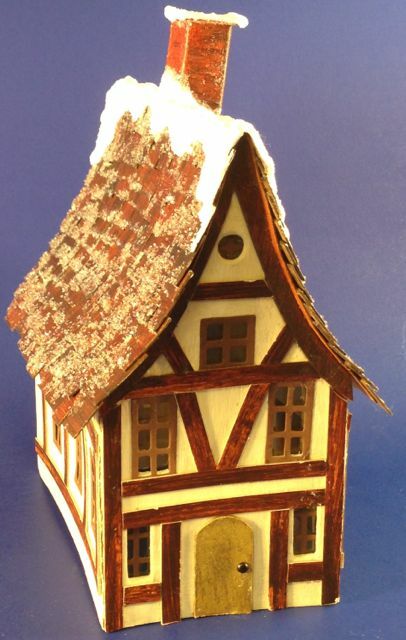 If you have ever tried to make a little glitter house, you know that when you are holding the roof done to be glued, it wants to curve inward anyway. I did glue some strips of cardstock underneath to provide good support as well. Then I made many little shingles to shingle the roof. And here you can see the house without the base. I’ll get better photos when I get the house on the base. This was a fairly easy house. What would I do differently? Move the door up so I can have a door step. Shorten the house so the length of the roofline is not so overwhelming. I would also use a different glitter because I like the shingles so much, I don’t want them obscured. This glitter is true German glass glitter. I would have used a lighter very fine glitter sparingly to show the details of the roof. 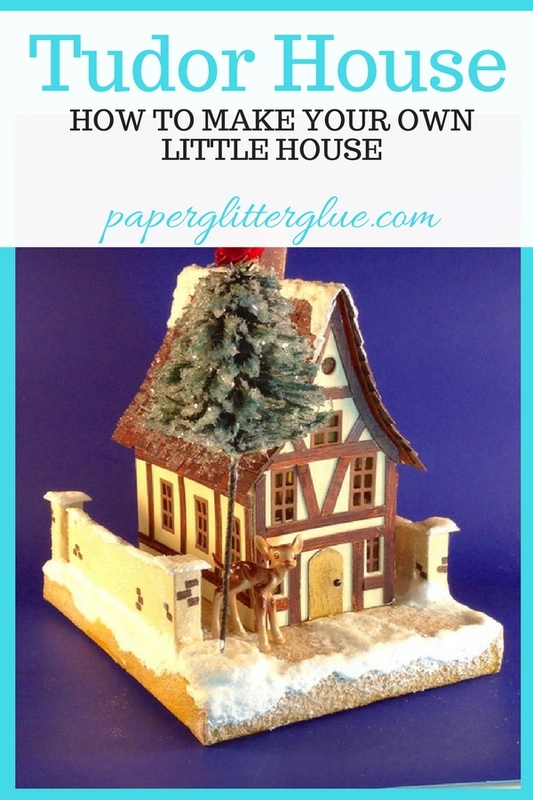 Update: I have a free pattern for this house which you can find in the Paper Glitter Glue Library. It does not include the instructions on making the half-timbered sides because you pretty much have to cut them to the size and the design that you like, but the structure of the house is there. The pattern also makes the Irish Cottage that you might like as well. Your houses are terrific, Lucy! Great inspiration for what I hope to do with mine, once I get past the test cutting stage. I have bookmarked your blog, so I can keep up to date with your projects. 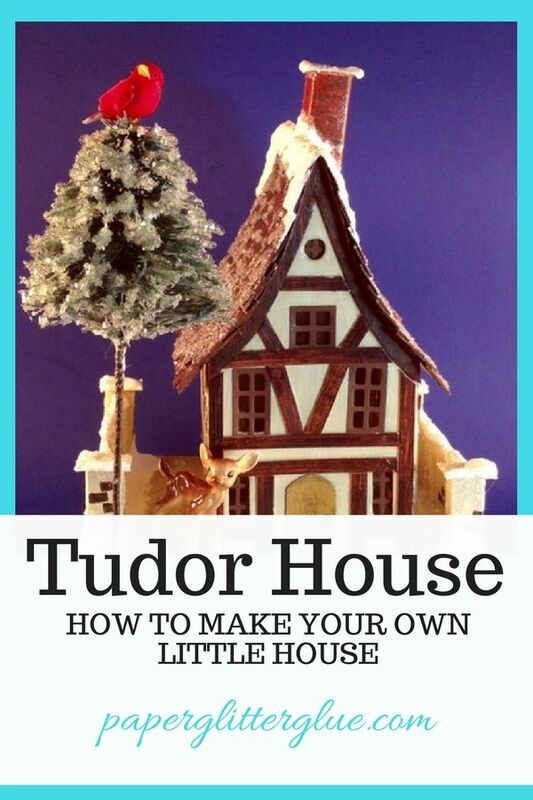 Fantastic, your tudor house is lovely and thanks for the mention, can't wait to see your tower house. Thank you, everybody. I need to take a photo of the Tudor house on its base. The base generally makes the house look better. I will be making more of this design.